Kofi Annan, one of the world's most celebrated diplomats and a charismatic symbol of the United Nations who rose through its ranks to become the first black African secretary-general, has died. He was 80. His foundation announced his death in Switzerland in a tweet, saying that he died after a short unspecified illness. "Wherever there was suffering or need, he reached out and touched many people with his deep compassion and empathy," the foundation said in a statement. Annan spent virtually his entire career as an administrator in the United Nations. His aristocratic style, cool-tempered elegance and political savvy helped guide his ascent to become its seventh secretary-general, and the first hired from within. He served two terms from Jan 1, 1997, to Dec 31, 2006, capped nearly mid-way when he and the UN were jointly awarded the Nobel Peace Prize in 2001. 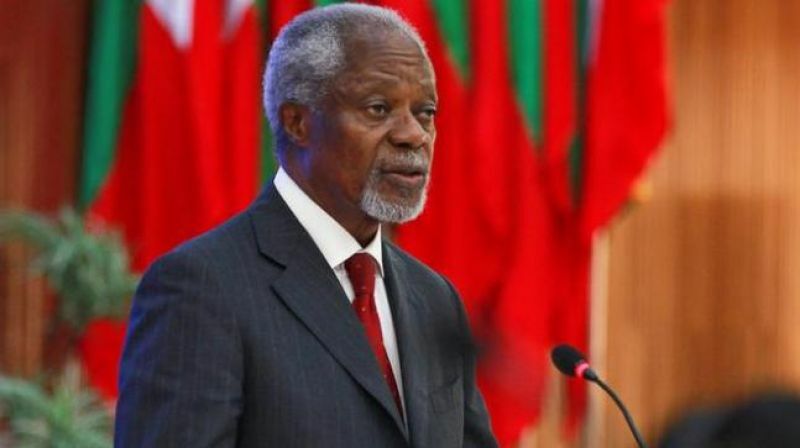 During his tenure, Annan presided over some of the worst failures and scandals at the world body, one of its most turbulent periods since its founding in 1945. Challenges from the outset forced him to spend much of his time struggling to restore its tarnished reputation. His enduring moral prestige remained largely undented, however, both through charisma and by virtue of having negotiated with most of the powers in the world. When he departed from the United Nations, he left behind a global organization far more aggressively engaged in peacekeeping and fighting poverty, setting the framework for the UN's 21st-century response to mass atrocities and its emphasis on human rights and development. "Kofi Annan was a guiding force for good," current UN Secretary-General Antonio Guterres said. "It is with profound sadness that I learned of his passing. In many ways, Kofi Annan was the United Nations. He rose through the ranks to lead the organization into the new millennium with matchless dignity and determination." Even out of office, Annan never completely left the UN orbit. He returned in special roles, including as the UN-Arab League's special envoy to Syria in 2012. He remained a powerful advocate for global causes through his eponymous foundation. Annan took on the top UN post six years after the collapse of the Soviet Union and presided during a decade when the world united against terrorism after the Sept 11 attacks then divided deeply over the US-led war against Iraq. The US relationship tested him as a world diplomatic leader. "I think that my darkest moment was the Iraq war, and the fact that we could not stop it," Annan said in a February 2013 interview with TIME magazine to mark the publication of his memoir, "Interventions: A Life in War and Peace." "I worked very hard I was working the phone, talking to leaders around the world. 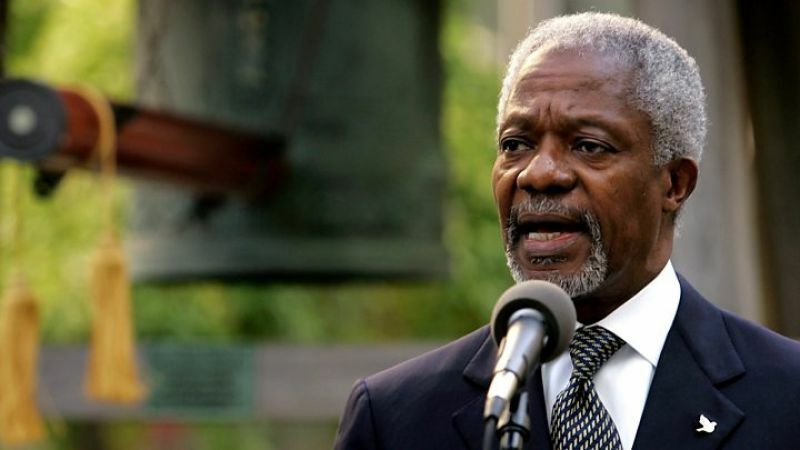 The US did not have the support in the Security Council," Annan recalled in the videotaped interview posted on The Kofi Annan Foundation's website. "So they decided to go without the council. But I think the council was right in not sanctioning the war," he said. "Could you imagine if the UN had endorsed the war in Iraq, what our reputation would be like? Although at that point, President (George W.) Bush said the UN was headed toward irrelevance because we had not supported the war. But now we know better." Despite his well-honed diplomatic skills, Annan was never afraid to speak candidly. That didn't always win him fans, particularly in the case of Bush's administration, with whom Annan's camp spent much time bickering. Much of his second term was spent at odds with the United States, the UN's biggest contributor, as he tried to lean on the nation to pay almost USD 2 billion in arrears. Kofi Atta Annan was born April 8, 1938, into an elite family in Kumasi, Ghana, the son of a provincial governor and grandson of two tribal chiefs. He shared his middle name Atta "twin" in Ghana's Akan language with a twin sister, Efua. He became fluent in English, French and several African languages, attending an elite boarding school and the University of Science and Technology in Kumasi. He finished his undergraduate work in economics at Macalester College in St Paul, Minnesota, in 1961. From there he went to Geneva, where he began his graduate studies in international affairs and launched his UN career. Annan married Titi Alakija, a Nigerian woman, in 1965, and they had a daughter, Ama, and a son, Kojo. He returned to the US in 1971 and earned a master's degree at the Massachusetts Institute of Technology's Sloan School of Management. The couple separated during the 1970s and, while working in Geneva, Annan met his second wife, Swedish lawyer Nane Lagergren. They married in 1984. 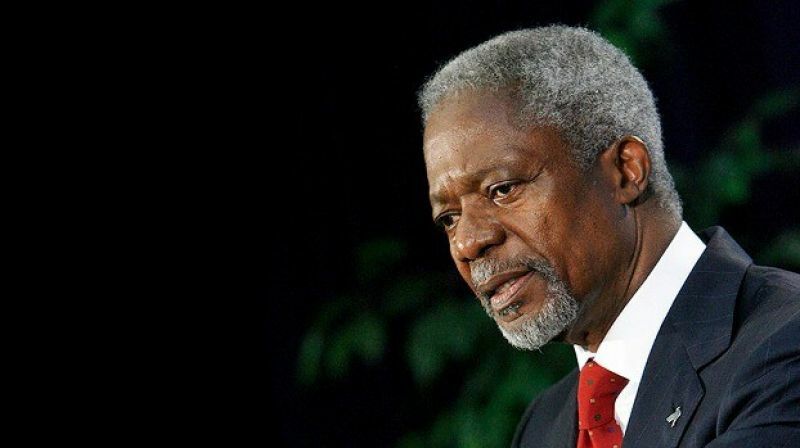 Annan worked for the UN Economic Commission for Africa in Ethiopia, its Emergency Force in Egypt, and the office of the High Commissioner for Refugees in Geneva, before taking a series of senior posts at UN headquarters in New York dealing with human resources, budget, finance, and staff security. He also had special assignments. After Iraq invaded Kuwait in 1990, he facilitated the repatriation from Iraq of more than 900 international staff and other non-Iraqi nationals, and the release of western hostages in Iraq. He led the initial negotiations with Iraq for the sale of oil in exchange for humanitarian relief.